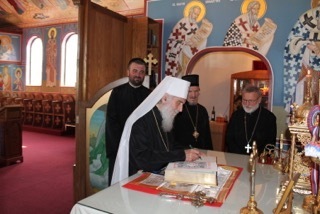 Windsor, Ontario - His Holiness Serbian Patriarch Irinej, administrator of the Diocese of Canada, visited the city of Windsor on Tuesday, June 16, the southernmost Serbian community in Canada. 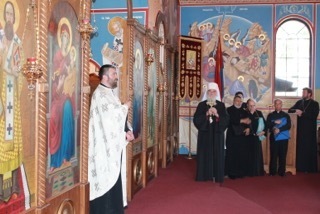 During his visit the patriarch visited the St. Demetrius the Great Martyr Church. 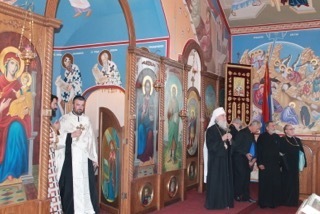 Accompanying the Serbian Patriarch were His Grace Bishop Mitrophan of Eastern America, V. Rev. 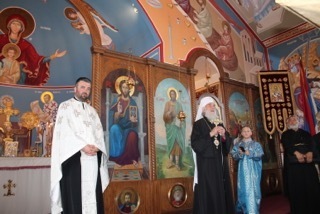 Stavrophor Vasilije Tomic, the Episcopal Deputy, Protodeacon Damjan Bozic and Milan Lesic, president of the St. George church board in Kitchener. The parish priest, V. Rev. 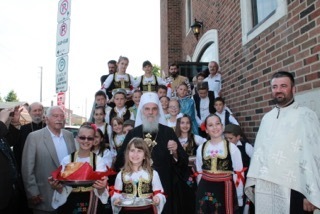 Jovica Cetkovic together with a large number of Orthodox clergy from this region of Canada welcomed His Holiness. 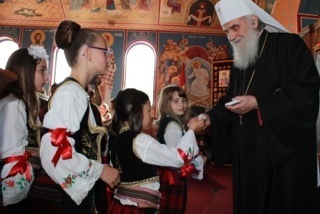 At the entrance to the church was welcomed by the children from the Serbian school with the traditional bread and salt and flowers. V. Rev. 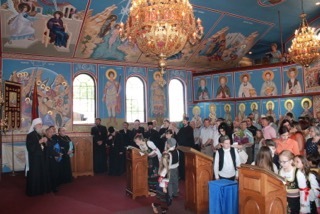 Jovica Cetkovic and Protodeacon Damjan Bozic served the Doxology service while the church choir sang the responses. Following the service Fr. Jovica Cvetkovic addressed His Holiness with words of welcome to which His Holiness, joyful at the large number of people in attendance, addressed the faithful. 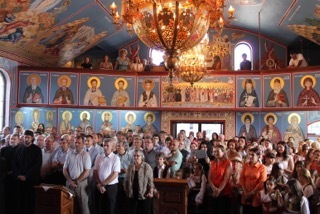 After his homily His Holiness blessed the faithful and gave to each of them a small icon and cross. During the day the members of the Circle of Serbian Sisters "Majka Jugovic" prepared a lenten dinner for all in attendance. 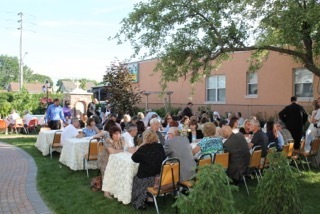 In the church courtyard a banquet was prepared to welcome His Holiness. 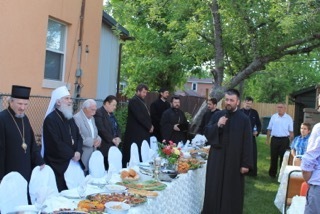 Also sitting at the head table were the Serbian clergy from Windsor and Detroit as well as clergy from the Romanian and Antiochian Churches in Windsor. After dinner the Patriarch stayed for some time with the youngest parishioners, expressing his delight that our children speak Serbian so well. 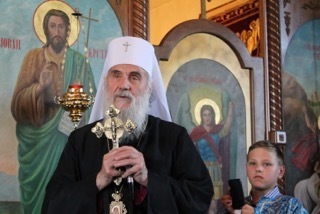 At around seven o'clock His Holiness Serbian Patriarch Irinej was bid farewell by the parishioners of St. Demetrius who wished him many years of leading the Serbian Orthodox Church to the spiritual benefit of all Serbian people. 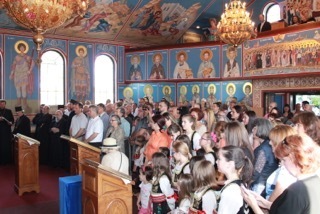 The St. Demetrius parish has some 200 Orthodox families in Windsor. Zarko Vucinic has been a long time president of the church board and also is honorary president Diocesan Council of the Diocese of Canada. Next year this church will celebrate their 50th anniversary. This parish contributed greatly to the unification of the Serbian Orthodox Church during the time of Patriarch Pavle of blessed repose. 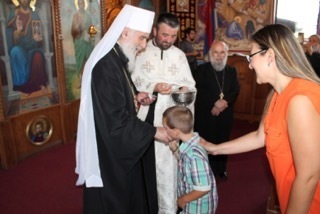 This was the third visit of His Holiness Serbian Patriarch Irinej to this church-school congregation. The first and second time were as Bishop of Nis and this was his first visit as Serbian Patriarch.